The Practicum program is an intensive application-based studio course taken by BFA students for degree completion. The 2015 Practicum class will be opening their graduate exhibition with a reception on the evening of Friday, March 20th at the Artlab Gallery, and we encourage conference attendants to arrive one day early so they may join faculty, students, and families for this celebration reception. In addition, the MFA/PhD Open Studio event will be happening throughout the afternoon and evening of Friday, March 20th, followed by an after-party/reception. A vault can be a number of things: a room, a space, a chamber, or a place to guard and protect the contents within. 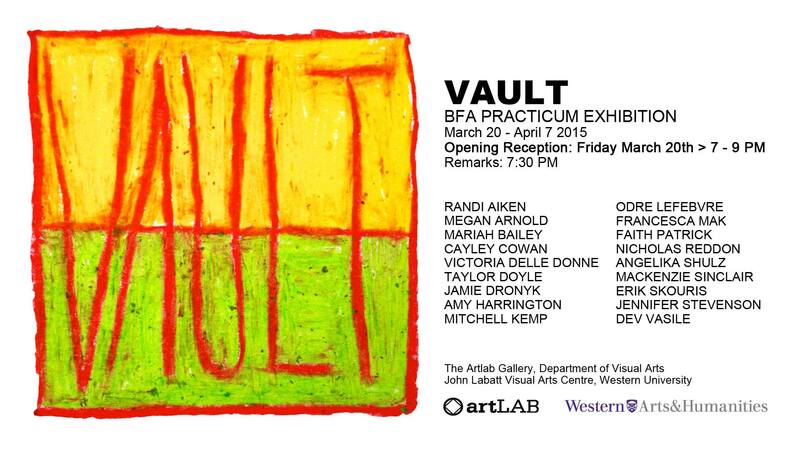 The Practicum VAULT represents the year long artistic explorations of the Studio Arts Practicum class of 2014/15. This exhibition showcases work that investigates competitive sport, materiality, and craft, while pushing the boundaries of uncertainty to address identity, performance, and sexuality. Instructed by Professors Kelly Wood and Patrick Howlett, our class looks forward to opening the doors of our VAULT on Friday March 20th 2015. VISIT VAULT’S BLOG to sneak a peek of what the class has been working on all year. VAULT facebook event page.